I was AWOL from the monthly In My Kitchen roundup in April but not without good cause; I was visiting Melbourne. My time there was well spent eating great food, visiting foodie friends and shopping at my old haunts. 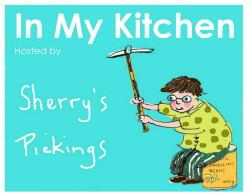 I’m linking my post for the month of May with the lovely Sherry from Sherry’s Picking’s who hosts this worldwide forum of food bloggers. Click on the link at the bottom of the page to see more. It was slightly surreal visiting Melbourne after being away for 30 months. The weather was sublime, the food fabulous and the traffic crazy. We were amazed, bemused and often frustrated by unexpected changes. Having endured the almost 2000 kilometre road trip I was determined to load up my car fridge with goodies to stock my Brisbane kitchen. We spent one entire day hunting and gathering. 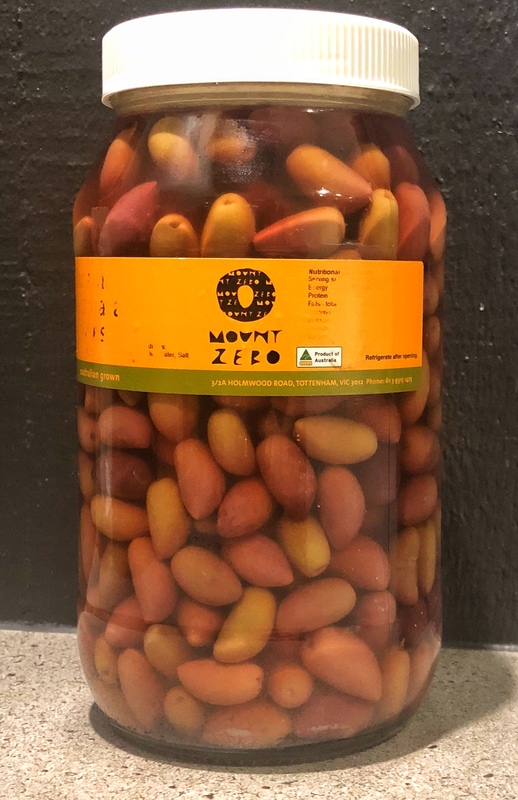 I was disappointed our dates didn’t coincide with my favourite Farmers Market but fortunately one of the delicatessens at the historic Queen Victoria Market is a reliable stockist of 2.5kg jars of my favourite kalamata olives from Mount Zero in western Victoria, so firstly I ticked olives off the list. Finally, again in my kitchen, I have the best kalamata olives I know. Turkish Delight, you either love it or hate it but you can see we’re in the former group. It’s hard to buy a good product that’s soft but not sticky, sweet but not cloying, and gently flavoured with natural ingredients. We love this particular Melbourne made Turkish Delight. There is just no substitute that doesn’t involve an overseas trip, but luckily Melbourne’s large eastern Mediterranean community is as equally demanding as me so we swung into BAS Foods in Brunswick to pick up a large box. In My Kitchen, for a short period of time I have delicious Turkish delight. As luck would have it, Meditteranean Wholesalers is in very close proximity to BAS Foods. I was on a mission to buy calasparra rice for Paella at a reasonable price. The exact same product they sell is marked up 300% at my local stockist, grrr. 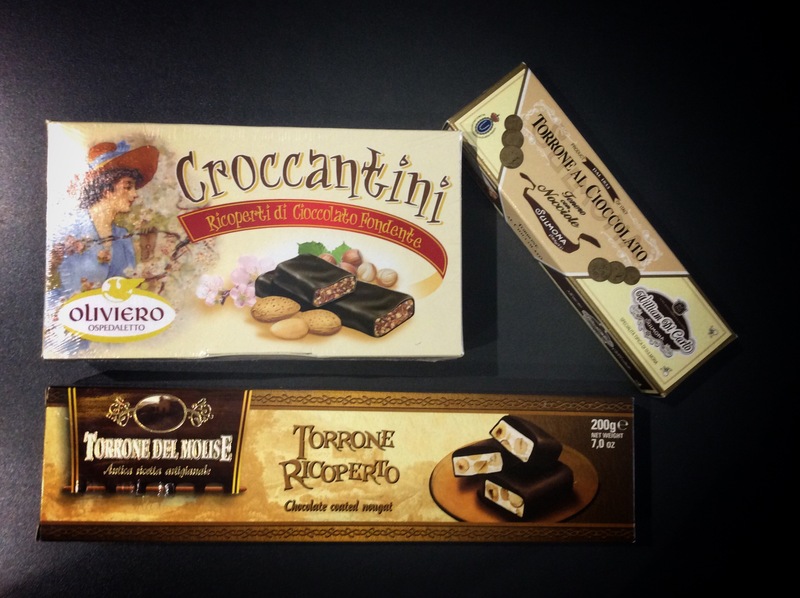 While we were there we also indulged in buying some indulgent Italian confectionary and grappa for the boys. We have a dear friend who is working toward self sufficiency. He makes cheese wine and salami like all self respecting men should. His parting gift to us after a long and delicious dinner was a box of quinces and a homemade made salami. Because Australia has such stringent quarantine laws governing the transportation of fruit and vegetables over state borders, I borrowed my daughters kitchen and peeled, cooked and froze the quinces for the journey. The arduous part of making quince paste, cooking the sweetened pulp into a ruby red paste is not a job for the feint of heart, weak of arm or those short on time, but now the job is done, I think it was worth the effort. I have a years’s supply of quince paste in my kitchen. On the last day we visited the butcher for several vacuum packed butterflied legs of lamb. There is nothing as sublime as roasted sweet young Victorian lamb and my experience since moving away has me convinced that they don’t ship the good stuff interstate. Roast lamb will be on the menu a number of times in the next 3 months, so In My Kitchen I will be roasting lamb. And lastly In My Kitchen I have the most accessible and useful cooking reference I have read in a long time. There are recipes in the back part of the book but it’s real value lays in the comprehensive and erudite chapters on the use of salt, fat, acid and heat and how each affects the flavour and texture of the food you prepare. 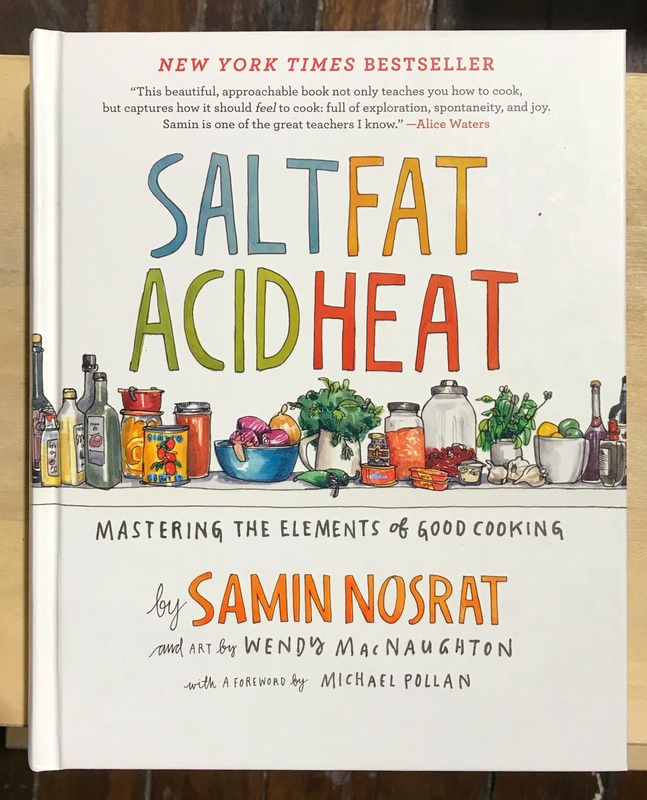 Those learning to cook and cooks hoping to improve their outcomes would benefit from reading and practicing what is recommended in Salt Fat Acid Heat: Mastering the Elements of Good Cooking by Samin Nosrat. Last week Nosrat was awarded the James Beard Award for this book, a well deserved recipient in my opinion. I must see if we have that book at the library (cutting back on book buying!) – looks like a very worthwhile read. Good to hear that Sandra. I ready this after shooting through to FNQ and it made me nostalgic for Melbourne, not that I went for long .Bas foods and the Medit, salami makers and Mt Zero olives- all lovely places and tastes and very Melbournian. Melb offers great diversity and quality but you know that, Qld is slowly getting there…. You’d be welcome. There’s a lot to learn from this book Margot, it’s well worth a read. I love Turkish delight and after visiting Turkey, I would love to try recreate some of their subtle but gentle flavors. The book looks wonderful, perfect for the bookshelf to use over and over. Samin Nosrat’s name sounded familiar and then i remembered why: i watched a documentary made by Michael Pollan – i think it was ‘Cooked’ or it might have been the ‘Omnivore’s Dilemma’ and there was a segment in which he was cooking and talking with Samin. She was very interesting. Your Melbourne holiday is my idea of heaven- i love the market there. Thanks Sherry, it’s good to be back. Quinces are heavy going from beginning to end but their beautiful flavour is well worth it. WA is the most pedantic for quarantine regulations, everyone is checked, we had mung beans seized. I guess it’s all or nothing. Now that I’ve been to Australia, I now understand why your road trips are so long!!! (Of course I could have just looked at a map!) A fun post. The wide regional variety of foods in Australia is fascinating. I think you have just about every climate zone, and can grow anything! The Mediterranean and tropical climate zones really give you lots of amazing produce. Too bad it isn’t shipped more so that you can get what you like in your new(ish) home. Between the time I finished reading this post and started writing this comment, I had looked up and purchased Salt Fat Acid Heat. Definitely right up my alley. Sounds like you had a real foodie adventure in Melbourne. Quince paste and your ruby red quinces are something I do every year. Cheese wouldn’t be the same without it. Please post your roast lamb tips. Here in Greece it is either cooked slowly in the oven so that falls off the bone or is roasted outdoors on a spit – always flavoured with garlic, oregano and lemon. And, bravo to your friend and his endeavours in salami and cheese making. Thanks Debi. I started out with the library’s copy of Salt Fat Acid Heat and within a day had ordered 2copies, one for me, one as a gift. I think the Greeks have perfected roasting lamb and my preferred method is roasted over coals so it’s slightly charred but still pink in the middle. I debone and butterfly the leg, make a marinade of honey, mustard, garlic and loads of rosemary, let it rest for 48hrs then roast it 200C in the oven for 40 mins, rest 20 before carving. Thank you, thank you, thank you (it’s best in threes) for the roast lamb instructions. Can’t wait until my copy of SFAH arrives. You did some good shopping! I think I heard the author of Salt, Fat, Acid, Heat interviewed on Radio National a while back. I was salivating gently by the time I’d finished reading your post…. There’s a Turkish shop in Brunswick I used to buy a particular spice at. It was something they mixed themselves, and they called it ‘Turkish Spice’. I used the last of it six months ago, so there’ll be some major foraging when we pass through Melbourne next year on our way to Tassie. This entry was posted on May 3, 2018 by ladyredspecs in Cooking, Food, In My Kitchen, recipes.